The activists demonstrating outside Max Brenner's chocolate shops across Australia are not anti-Israel but anti-Jewish, says Indigenous leader Warren Mundine. SEPTEMBER 20. That's the date that now looms like a dark cloud on the Middle East horizon after the decision by Palestinian Authority President Mahmoud Abbas to request formal recognition of the state of Palestine by the UN. Palestinian officials believe almost 120 nations support Palestine becoming the 194th member of the international organisation. Aside from the fact the UN has been a bastion of anti-Israel sentiment and a platform for Israel bashing, Australia should not be among the majority of states that vote for Palestinian statehood. First, Australia is committed to a two-state solution. It rightly supports the establishment of a Palestinian state. So do I. And so do the vast majority of Israelis. But that commitment is conditional on the right of Israel to live in peaceful and secure borders, a right that is mutually exclusive to the charter of Hamas, Abbas's political bedfellow and a terror organisation that has held [Israeli soldier] Gilad Shalit in captivity since June 2006 and whose military wing is rightly outlawed in Australia. But here's the rub: Australia's longstanding support for a two-state solution is based on bilateralism: namely, that the two parties, Israelis and Palestinians, hold direct negotiations. But the Palestinian demand for statehood via the UN is unilateral, despite claims to the contrary by Abbas. Second, the Palestinians' bid to seek statehood via the UN is akin to a match to dynamite. Already Palestinian officials claim to be planning worldwide protests -- most probably including here in Australia -- to coincide with the September 20 vote. Mass unrest across the Palestinian territories and Arab world is likely. And that's a prescription for yet another black chapter in a century-old conflict that has been written in blood. Third, Kevin Rudd's alleged preference to abstain has been widely reported as an attempt to appease the Arab bloc, which he wants to support Australia's bid for a temporary seat at the UN Security Council in 2013. Rudd's longstanding support for Israel is on the record and his appetite for Australia to punch above its weight on the international arena is to be admired. And the fact Australia, a founding member of the UN, hasn't had a seat at the Security Council since 1986 should be rectified. He would be well aware that Lebanon will replace India as president of the Security Council next month, which is precisely why the Palestinians have chosen September 20 as their date. Yes, this is very same Lebanon that dissociated itself from a Security Council statement earlier this month condemning the Syrian regime's massacre of civilians. Rudd is right to want to bring Australia's morality and integrity to the table, but he's wrong to do so by sacrificing Israel on the altar of the UN. Fortunately, Julia Gillard, whose moral clarity on the Middle East was first evident when she backed Israel in its war against Hamas in December 2008, is reportedly at odds with Rudd's view. Fourth, a yes vote at the UN General Assembly will be nothing but a Pyrrhic victory for the Palestinians. Why? Because full membership requires the backing of the 15-member Security Council and the US has already stated its intention to veto the proposal. So what the Palestinians will likely end up with is the status of a non-member state, an upgrade from its observer status but a step short of full membership, which requires a two-thirds majority of the 193 countries in the General Assembly. Abbas will achieve a toothless resolution in the General Assembly with no legal force. Even the liberal New York Times, in its editorial of August 6, concluded that Abbas's strategy would leave him "empty-handed", saying: "After the initial exhilaration, Palestinians would be even more alienated, while extremists would try to exploit that disaffection." Australia should not be party to such a scenario. Finally, an abstention by Australia's envoy to the UN would be (mis)construed by the Greens -- and their leftist allies -- as a victory. For despite Bob Brown's public statements, among his growing ranks are those who try to disguise their anti-Israel vitriol under the veneer of progressive politics. The newly elected senator for NSW, Lee Rhiannon, is the quintessential case in point. She openly defended Marrickville Council's ill-fated support for the Israel boycott, a campaign that has morphed into the targeting of Max Brenner chocolate shops across Australia. Make no mistake. Factions of this mob of anti-Israel protesters -- some of whom are due in court next month for breaching bail conditions after they were initially arrested in the melee outside Max Brenner in Melbourne on July 1 -- are red, not green. One of their chants reveals their true colour: "From the river to the sea, Palestine will be free!" This is straight out of the Hamas song sheet and is not-so-subtle code for the elimination of Israel and, in its place, a Palestinian state between the Jordan River and the Mediterranean. Moreover, what is so galling is their rank hypocrisy. Where are the mass protests about the slaughter of innocents in Syria, or Libya, or Egypt? Their silence about these crimes is deafening. Optimists hope that this act of unilateralism by the Palestinians will help resuscitate the stillborn peace process because the alternative is much worse. But it's a forlorn hope. In the end, the real question is not what happens in New York on September 20. There's little doubt the resolution will pass in the General Assembly but be vetoed in the Security Council, but what happens in Ramallah, Nablus, Hebron, Gaza, Lebanon and elsewhere on September 21? Unfortunately, the tragedy is that this unilateral attempt to declare a Palestinian state will light another fuse in the combustible Middle East. 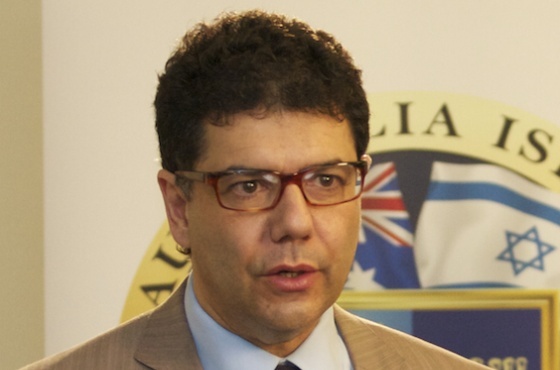 Albert Dadon AM is the founder and chairman of the Australia Israel Cultural Exchange and the Australia Israel Leadership Forum. This article was first published in the Australian newspaper on 23 August 2011.